Don’t Panic This Wednesday, Humboldt! Tsunami Sirens Will Blare But it’s Only a Test! Humboldt County will participate in the annual live code test on Wednesday as part of Tsunami Preparedness Week. From approximately 11 a.m. until noon, tsunami sirens will be activated, along with other emergency notification systems, including NOAA weather radio, television, and radio test alerts. Individuals who are registered to receive alerts through county, city, or organizational mass notification systems may also receive voice, text, and/or email notifications. By testing emergency notification systems it helps to ensure that those systems are operational in case of an actual emergency, and lets potential recipients of emergency messaging know what to expect. The Civil Air Patrol will also be performing a coastal overflight with audio, weather permitting. Seismic activity that is not felt in Humboldt County can still cause a tsunami in our area. These are know as “distant-source” tsunamis. Emergency and mass-notification systems including sirens that warn of potential emergencies are most effective in warning of this type of tsunami. Sign up to receive emergency alerts from the Sheriff’s Office. A local-source tsunami, on the other hand, may arrive in as few as 10 minutes following a major local earthquake. It is important for all residents and visitors to know that strong ground shaking lasting 20 seconds or longer is our warning to immediately evacuate tsunami zones, before checking to find out if an advisory or warning has been issued. You should remain out of the zone until the tsunami warning is officially canceled. While an earthquake is the most likely natural warning sign that a tsunami is coming, other natural warnings include the ocean water moving far out from the coast, exposing the sea floor, or hearing an unusually load roar from the coast. If you are in a tsunami evacuation zone and notice any of the above warnings, move to higher ground or inland as soon as it is safe to do so. Local tsunami zone maps created by the Redwood Coast Tsunami Work Group are available on the Humboldt State University website. 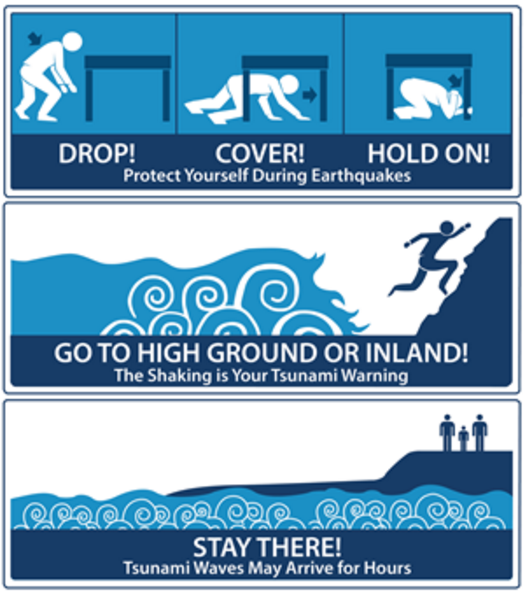 Check out the Living on Shaky Ground website to learn more about how to survive earthquakes and tsunamis in Northern California.